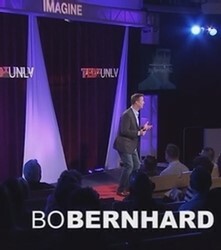 In Bob's video above he references this TEDTalk at UNLV with Bo Bernhard PhD, a professor in the Wiliam F. Harrah College of Hotel Administration at UNLV and Executive Director of the International Gaming Institute. Watch the entire video here and learn exactly why Las Vegas is S-M-A-R-T. He will tell you exactly how Las Vegas is leading the world in greatness! We think you will just LOVE this video and will want to share it with all of your favorite Las Vegans!